I couldn’t wait to take the thing for a spin, but needed to charge the battery up first. It charged up within a few hours and I was ready to go. A little aprehensive to be honest. I went on the road and started to pedal, It’s really a weird feeling at first when the power kicks in as you just suddenly start accelerating. If you don’t keep on pedalling the electric motor which is located in the rear wheel hub stops and you start coasting again. This all takes some getting used to but you can instantly feel how much it’s going to help with the journey. Located on the handlebars are a control button,throttle and 3 lights, The lights indicate how much power you have still left in the battery. I’ve never really taken much notice about these as they light up differently depending on whether you are pedalling or not, I find it’s better to just rely on how long you have been riding since you charged the battery. 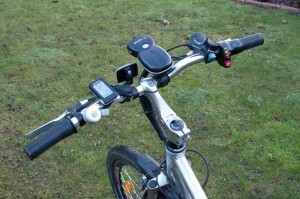 The button on the handlebars is used to turn the whole electric system on and off, and the throttle is used to manually turn on the electric motor when you want to. I use this if I’m in a tight passageway and can’t really pedal properly, You can just turn the throttle and it will wizz you along without you pedalling. You have to be aware when riding it that the electric assistance takes a few seconds to fully turn off after it’s started so when your coming up to traffic lights or somewhere you need to stop you stop pedalling a little short and just cruise to the stop. Otherwise your likely to overshoot and have to use your breaks heavily. When on a flat and pedalling gently the bike will quite happily take you up to approximately 15 miles an hour, I think this is the legal limit on UK roads. You can of course pedal more and go faster but the electric assistance will have cut out automatically. With no pedalling and just using the electric throttle the bike will probably go about 8 miles an hour by itself on the flat. Going up hill is where the bike comes into it’s own, Previously huffing and puffing and struggling to go up the hill on the way slowly at about 8 miles an hour, I could now comfortably go up the hill at about double that. It feels like your using about the same amount of energy to pedal it uphill as you would normally use to pedal a standard bike on the flat. I found when the bike was new on a full charge I could do about 16 miles before needing to be charged again, The specifications for the bike indicate I should be able to get a lot more than that but 16 miles was fine for me. You do have to be careful with cars now though as they don’t realise how fast you can now go, So they pull out just in front of you and your basically up to their back window before they realise. I would only ride a bike on our roads with lots of reflective gear on and lots of lights in the dark. I also believe a helmet is very essential. The bike itself has 7 gears, which may seem pretty poor compared with a normal mountain bike which might come with 20 or so gears. But you don’t really need them and having just 7 gears makes the gear changing fewer and seems easier to maintain than ones with many more gears, to me anyway. It perhaps would be nice to have a couple more gears for when you are on the flat but it doesn’t really matter. The bike cut down my return journey home from 40 or so minutes down to 20, and I get to work in the morning feeling very refreshed now and hardly breaking a sweat. Contrary to what people think when I tell them I’ve got an electric bike, it does actually keep you fairly fit. You do still have to pedal to go at any kind of speed. For people who find cycling too much for them an electric bike may be the way to get cycling again. After using the bike in different weather, I did find that the front brake which is a standard V-brake did squeak a lot in the wet, So I replaced this quite soon after purchasing with some different Shimano V-Brakes. The rear brake is great and I’ve never needed to adjust this is anyway it appears to just pull a band around the hub motor and does the trick well. I also filled the tyres with slime puncture prevention fluid, I had read that removing the tyres is not much fun on this bike so I did this so I didn’t have to attempt to repair a puncture on the road. Since getting the bike about 2 and a half years ago I have used the bike daily for my commute to work and have clocked up approximately 5000 miles on it, the bike has been a real workhorse for me. It’s really funny slowly cruising past the professional cycling when your hardly pedalling, you get some funny looks until they realise it’s electric. Sometimes they try to keep up for a while. It’s only failed a couple of times and those were not it’s fault really. Once I’d forgotten to charge it and got half way home and it stopped so I had to push it the rest of the way. And the second time was when the tyre exploded, not quite sure why this happened but they were getting quite worn and I think I must have ridden over a nail or something. It was quite funny seeing the green slime spray everywhere when it happened though. When this happened I decided to change the tyres to Schwalbe Marathon Plus tyres which I have had on since, these do not have the green slime within them but have an armored piece of material around the tyre to stop punctures. We’ll just have to see how these get on after a while. I thought it would be very hard to change the tyres after what other people had said but I didn’t find it much more difficult than a normal bike, It was just about making sure you had the right tools and take your time. I also upgraded the kick stand that holds the bike up when not in use to a different one . After a couple of years wear and tear the original stand lost it’s capability to stay up when riding and people where yelling at me when cycling to tell me it’s down. 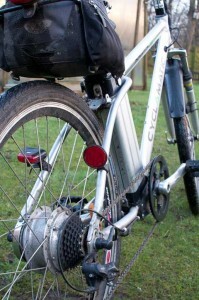 A kick stand is a necessity on an electric bike as the bike is really heavy compared with a normal bike with the extra weight of the battery. To allow me to carry my lunch to work I needed some kind of carrier to put on the bike, I don’t really enjoy having a rucksack on my back while riding. 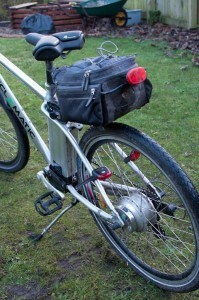 I decided the best thing would be a VAUDE Off Road bag which clips onto the seat post. It holds the bag over the back wheel which has the added benefit of acting like a rear mudguard protecting my back from mud splatters. The bag is actually suprisingly large and also has two zippable pockets either side of the main bag to hold tools and little items. After a few thousand miles the bike did start to develop a crunchy sound from the pedals and was not smooth pedalling any more, this progressively got worse until I needed to do something about it. Eventually I decided that it was something to do with the bottom bracket, this is the thing which the pedals spindle go’s through and turns as you pedal. It consists of two sets of caged bearings which the spindle goes through. After replacing this with standard replacement parts the problem was gone and it’s smooth again. 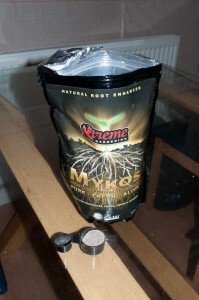 The original one had a ball bearing which had a slight gash in it, I guess this is what made it rough. I have also recently changed the seat to an alternative one,. I’m not sure if the current one I have is any better than the original one though so I may put this back eventually. But the new one may just need bedding in to make it more squishy so I’ll leave it for a while and see. One of the other items I have on the bike is a CATEYE Commuter Computer, I got this one rather than a standard cheap one as it’s got some cool features that are handy for my bike. The main thing is I can sort of use it as a electric fuel gauge. You can program into the computer a set distance for a journey so I have this set to 15 miles to match how much I want to do on a full charge. When I charge my battery I just clear the distance by pushing on the computer for a few seconds, then a bar goes up on the display to indicate how close I am to the distance. So when the bar is all the way up on the display I know I need to charge it. The display also shows me the current time, the current temperature as well as the current distance I’ve travelled. I would recommend this bike to anyone, especially if you don’t mind tinkering a little to keep the bike in check. The price of the bike is currently £499 which is more expensive than I paid, but it’s still one of the most economical electric bikes you can buy. 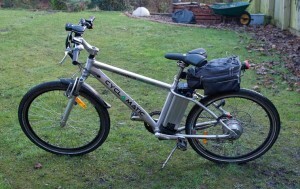 This entry was posted in Other Stuff and tagged cyclamatic, cycle, cycling, ebike, electric bike, pedelec, power plus by Paul Ellams. Bookmark the permalink. I am considering this bike for my first e bike. I bought the bike in April and it now has packed up. It is not the battery. I can not get any assistance from Amazon or indeed the seller. Until I have had satisfactory communication from seller I would not recommend this bike. excellent review! i think i’ll buy one. Do you have any idea where I can get spares? I need to repair a brake. If it’s for the front brake I just replaced them with standard shimano ones quite early on as they squeaked so much. But I think you could struggle to get spares for the back brake, your only choice really is to try and get them from “thesportshq” who distribute the bike in this country. Unfortunately I don’t, I thought maybe all the keys were the same. I had a spare for my previous bike but I’ve just tried the key in someone elses and it doesn’t work. They are provided with the battery I think it’s probably unlikely you could get a spare, unless the company you got the bike from could provide a new lock for the battery with it’s associated keys. I don’t have my Cyclamatic power plus electric bike any more so I cannot confirm this, but on my current Electric bike that is how it works so I’m pretty sure it is the same. I can’t even compress the rear brake lever on my cyclamatic so no rear brake .any ideas. I don’t have my Cyclamatic any more so I can’t really check anything , But I’m sure I adjusted the rear band which goes around the motor at the back a couple of times to make it work better. Maybe the brake cable needs re-adjusting to make it the right tension. I think the motor has gone wrong on mine as it doesn’t work. It is a very nice ride but the battery only lasted 10 miles maximum. Yes, Mine went like that and so has a friends, That’s why I changed to a different bike a few years ago now. They are not cheap though. 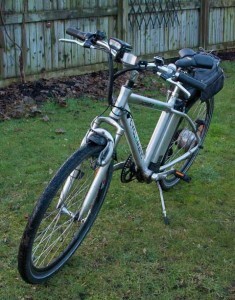 I did notice myself that I had to keep fastening the handlebars up very often, I got rid of my Cyclamatic several years ago now due to numerous problems which ended with the battery dying.